The Beretta 92FS has been a standard issue firearm for many military and police officers for decades because it’s a reliable, accurate weapon. Many civilians choose this firearm for home protection and everyday carry because, even after decades, you can still count on it firing reliably when you pull the trigger. This holster review will help you select the best holster for the Beretta 92FS. Highly accurate: meets or beats the US military requirement of 10 shots within a 3” area from 50 meters. Open slide design: improves bullet cycling and reduces misfire problems like stove-piping. Sweat and corrosion-resistant finish: the unique finish is also anti-glare so sunlight will never glint off your gun. Ambidextrous safety: suitable for use by left or right-handed shooters. Rounded hammer: the hammer design is snag-resistant and makes it more comfortable when wearing concealed. Single/double action: can be fired whichever way you prefer. Nothing in life is perfect, so there are also a couple of negatives about this firearm. Large and heavy: the 92FS weights 33.3 oz unloaded and is 8.5” long and 1.5” wide. It may be too much gun to conceal for some people. The size may also make it harder for people with smaller hands and shorter fingers to shoot. Double action trigger: the double action trigger on the 92FS is heavy, which may cause your first shot to be less accurate. The Beretta 92FS is a fairly large gun so it may not be suitable for concealed carrying for all shooters. Inside the waistband (IWB) concealment is possible if you’re willing to accommodate a large gun. Many people successfully conceal 1911 style guns, so if you have a holster that sits close to the body and has a small footprint you can certainly conceal this Beretta as well. If you prefer to carry outside the waistband (OWB), it’s possible to conceal the 92FS with a good holster at the kidney position. Even with the best holster and a jacket, the 92FS is probably going to be too bulky to conceal if you carry at the hip. If concealment isn’t your goal, there are plenty of OWB holsters that would work with the Beretta. A suitable holster for the Beretta 92FS, or any firearm, should fit the firearm snugly. There should be some form of retention like a strap, a button, or a tight enough fit to hold the firearm in place no matter how you move. The Beretta features a number of safety measures, but even so, a quality holster should cover the trigger to prevent unintended firing. The holster should also fit snugly to your body with little to no movement or shifting throughout the day. The more your holster moves, the more you have to change your draw. In an emergency, you don’t want to be fumbling around to find the handle of your gun because your holster moved. The Beretta 92FS is an extremely well-made gun, so it should last through decades of heavy use. Your holster should be durable enough to ride along with your gun for as many of those years as possible. Since the gun is heavy, you want to make sure that your holster is strong enough to support it. You’ll also need a sturdy gun belt. There are numerous suitable options, but this one from Relentless Tactile is well-liked by many shooting enthusiasts. All of the holsters on our list can be used for concealed carry with the Beretta 92FS. No matter your personal preference for carry location and holster aesthetics, you’re sure to find a holster you’ll love for the 92FS. Long-lasting: The polymer holster is composed of durable high-tech polymer material making it durable, light weight, water resistant, sweat resistant, and wear resistant. Widely Used: Designed for enduring the hardest operating conditions, the gun holster is an ideal equipment for military, courser, shooting coach, law enforcement agencies or personal protection use. The Sumtop is made from a lightweight polymer, which is nice when you’re carrying a heavy gun. The cant, or angle at which the gun rests in the holster, can be adjusted to any angle you prefer. This allows you to customize the holster for your perfect draw. Many people prefer an FBI cant, or a slight forward angle, for the quickest draw speed. The Sumtop is designed to make an audible click when you’ve properly holstered your firearm. It’s a custom fit for the 92FS, so you can be assured that your gun will stay securely in place no matter how you move. This holster also has a button release retention. When you want to draw, simply depress the button and pull the gun out. The button is placed in a way that positions your finger safely off the trigger but close enough to defensively fire quickly. 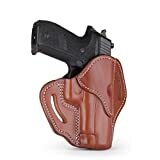 The only major downside of this holster is that it only comes in a right-handed model, so it’s suitable for right-handed strong-side carry (carrying on the side of your dominant hand) or left-handed crossbody carry (carrying on your weak-side and reaching across your body to draw). The 1791 GunLeather holster is designed for OWB carry and can either be concealed or carried openly. Leather holsters like this one require no retention strap because they mold to perfectly fit your gun, providing passive retention. The holster is designed to fit on your belt with a forward cant for an efficient draw. Some shooters prefer leather holsters because there’s no button to depress or strap to release. To draw, simply grip the handle and pull and your weapon is ready to use. The forward cant also aids in concealing because the gun won’t hang down as far below your belt. Leather holsters can be a little bulky, so this one may be difficult to conceal if you prefer to carry on your hip. However, it would be a comfortable option for OWB kidney carry concealment, especially because it comes pre-curved to fit more closely to your body. The high-quality craftsmanship and leather is guaranteed to last a lifetime, or at least long enough to match the lifespan of your Beretta. This leather holster is also just plain handsome and would be a great addition to any gun owner’s collection. The only downside of this holster is that the leather is very stiff, even compared to other leather holsters. It may require extra time and effort to get it to mold to your gun as perfectly as it needs to for adequate retention. The Blackhawk SERPA CQC holster is a great option for your Beretta 92FS. It’s made from durable carbon fiber so it can withstand daily, heavy use. It’s already perfectly molded to your gun, so you won’t have a break-in period as you’d have with the 1791 GunLeather OWB holster. The CQC is designed to be worn OWB, so it’s best concealed with a jacket or a long, untucked shirt. It comes with both a belt loop platform and a paddle platform so it can be worn in whichever way is most comfortable for you. The CQC holster also has a retention screw that you can adjust to get a snug fit that’s perfect for your 92FS. This holster comes in a left or right-hand model, so it’s a good option for any shooter. Each holster features adjustable tension to suit the user's preferences. A wide range of available holster bodies offer specialized protection for any line of pistol. A low profile design allows for high concealability and effortless draw, an ideal replacement for a Kydex or leather holster. 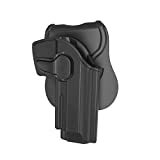 This holster is made of a polymer which the company claims is superior to thermoplastics like Kydex. This holster is specifically designed to fit the Beretta 92FS, so when you holster your gun it’ll snap securely into place. Like the Blackhawk, this holster will not require a break-in period. The custom cut of the Tactical Scorpion Gear holster is so precise that you don’t need a release button or retention strap to secure your weapon. Some shooters prefer holsters without retention straps because the draw can be more cumbersome when you have to fumble with a strap. If you feel like you need a little more retention, you can adjust the screws to get it to your preferred tightness. The waistband paddle is thin and softer than thermoplastics, making it more comfortable to wear than some other hard-case holsters. The thin paddle also keeps the firearm closer to your body which aids in concealment. 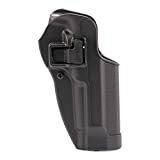 The overall footprint of this holster is slimmer and lighter than some others on our list, which is especially beneficial given the large size of the 92FS. The Tactical Scorpion Gear holster is great for smaller-framed shooters who worry about effectively concealing their 92FS. If you’re interested in owning a high-quality Blackhawk holster but the CQC we reviewed above is a little outside of your price range, you might like the more affordable Sportster holster. It offers the same patented SERPA Auto-Lock retention technology as the CQC, so even at a lower price point, you can be assured that your Beretta will stay safely and securely in your holster. The Sportster also features adjustable retention screws so you can dial in your retention to the exact level you prefer. You can also adjust the cant of the holster to multiple positions for your most comfortable draw. Like the CQC and the Sumtop, the Sportster will audibly click when you’ve securely holstered your 92FS. The Sportster holster comes with a paddle platform, but unlike the CQC it does not include a belt loop platform. The main difference between the CQC and the Sportster is the materials they’re made from. The CQC is made from durable carbon fiber, while the Sportster is made from a lightweight polymer. The Sportster is a great holster, it’s just not as well suited to daily, heavy use like the CQC. If you don’t intend to carry daily or you want a lightweight holster, the Sportster would be a great option for you. The Beretta 92FS is a well-made classic that deserves a high-quality holster. Whether you want to carry concealed or open, in a leather holster or a hard-cased holster, you’re sure to have found the best holster for the Beretta 92FS on our list. If you’re more of the DIY type check out our article on how to make a gun holster out of duct tape.